Researchers at SITraN, the University of Sheffield’s motor neuron disease research centre, have shed light on how mutations in the high-risk C9ORF72 gene specifically affect motor neurons. In order to address how the specialised nerve cells that control voluntary movements die, the Sheffield MND research team has looked at changes that specifically occur in motor neurons in the most common genetic cause of MND linked to mutations in the C9ORF72 gene. They have found evidence that repetitive sequences found within this gene in people with MND can be toxic and lead to a widespread malfunction of gene expression. The ribonucleic acid (RNA) copies produced from the C9ORF72 gene in MND patients are faulty, and instead of being used to produce the C9orf72 protein they cause mayhem in the cell. They accumulate in speckles termed RNA foci and by binding and hording nuclear processing and export factors, they affect the correct expression of other genes. The researchers conclude that this may not immediately result in disease; however in time compensatory mechanisms might be overwhelmed in vulnerable cells. 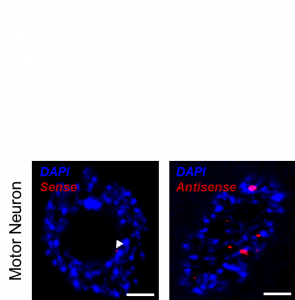 Motor neurons accumulate significantly more faulty antisense C9ORF72 RNA than sense RNA which forms nuclear speckles “RNA foci” (here shown in red with DAPI nuclear staining in blue). Scale bar 3μm. Studying tissue from C9ORF72-MND patients the researchers also found that motor neurons, the prime targets in MND, accumulate a distinct type of RNA produced from the C9ORF72 gene. The faulty gene sequence is copied in both directions, termed ‘sense’ in the direction of the gene and ‘antisense’ referring to the reverse copy. The study now published in Acta Neuropathologica concludes that antisense foci are present at a significantly higher frequency in motor neurons than in other nerve cells studied. Moreover, the presence of antisense foci, but not sense foci, correlated significantly with nuclear loss of the protein TDP-43 which is the hallmark of MND neurodegeneration. The scientists also observed antisense foci in the cytoplasm of motor neurons, which is consistent with defective export of the faulty RNA copies from the nucleus, and may be a key step in the production of toxic protein derived from the antisense RNA. More on this new C9ORF72 research can be found on the Alzheimer’s Forum.